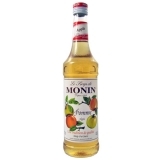 Monin Green Apple (Pomme Verte in French) syrup in stylish 70cl glass bottle. Green apples feature a light, bright green colour, though some may have a pink blush. 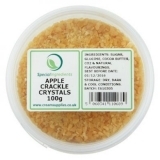 They are crisp, juicy, tart, sweet apples, which are excellent for both cooking and eating raw. The most known green apple variety is the Granny Smith, said to have originated in Australia. Monin Green Apple features the refreshing taste of green apples that can be further enhanced by combining with other tart - sweet flavours, or subdued by mixing with rich and sweet flavours. Colour: Clear bright green colour with yellow glints. 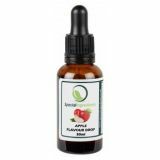 Taste: Nose of freshly cut Granny Smith apple; tart, sweet and juicy taste of green apple, very refreshing. Application: Sodas, lemonades, cocktails, teas, fruit punches, smoothies. Sugar, water, concentrated green apple juice, acidifying agent: citric acid, flavouring, colouring agents: E102, E133, Green apple juice: 10% minimum. Please note - E102 may have an adverse affect on activity and attention in children.